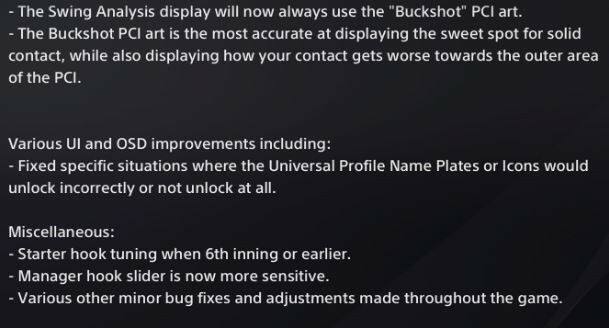 MLB The Show 17 patch 1.07 is available now, weighing in at just over 47 MB. Check out the patch notes below and post your thoughts. Thanks FL1GHTMARE! MLB The Show 17 patch 1.07 is available now, weighing in at just over 47 MB. Check out the full list of fixes below and post your thoughts. Thanks FL1GHTMARE! Wasnt expecting another patch so quickly. Im so glad to hear they tuned the CPU logic so the AI wont waste the backup catcher, then put a position player in as catcher. I hope they also tuned the CPU to not pull the closer so quickly when there is 2 outs and he gives up a hit, and they bring in another pitcher to get the final out. I must need a permission to view the jpg's. Not a fan of the buckshot PCI for swing analysis, doesn't make much sense when it's not the PCI I use. Not convinced it's remotely realistic in terms of how close to the sweet spot you are either, surely the bat shaped Wedge should be the more accurate? In real life if I miss the middle by an inch horizontally, I still hit the ball pretty well, if I swing an inch under it I miss it completely, a bat isn't round like a tennis racket? Seems like instead of addressing the issues with the dodgy hitting, they've just changed the swing analysis instead? Played a game early this morning after installing the patch. All looks good. 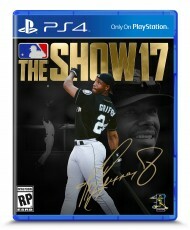 Thanks to SDS for continuing to improve on the game! With the starter hook and manager hook adjusted, I am hoping it doesn't go back to astronomical complete games again like 16. Sounds good though. All it needed was a tweak. Surprised another patch was offered. Outstanding work. is a restart required for online franchise and created player issue? Has anyone (Post Patch 1.07) noticed any framerate improvements with Enhanced Visual or 4k modes??? Yes. I find it hard to believe that what appears to be a simple "icon" display change would help make the feedback appear more accurate. I am 17 games into my franchise, and the display shows Curtis Granderson's stats for the current year of the franchise, but underneath shows 138 games. I have reported it in the Bug/Glitch on the Shownation Thread, but no responses. Does anyone know?? I'm appreciative they hear the feedback of the community and attempt to address it. I don't know if it's me or the patch. But I make it about 30 minutes into a game or road to the show and all the sudden the show freezes, the game turns off and an error message appears. Making it pointless to start a game. I also noticed the all the sudden there is a tremendous amount of passed balls and anytime the swing/pitch analysis is shown the pci is shown in buckshot? Is this the patch, has anybody else had their game just free and the game just turns off? Any advice? I know I downloaded the patch I also downloaded something to allow me to go online with the game which took about four hours to download please help. I'm going to wait for it to happen again so I can see the error code that pops up. Can anyone test if the CPU sets their relievers to "ready & waiting" after they are fully warm? - Adjustment to lineup and manager hook logic to prevent teams from replacing the backup catcher, causing him to be unavailable in late inning situations. This can happen when CPU start (mis)managing roster movements. If this happens on the team you as a pitcher are on in RTTS, the game has been basically unplayable. I'm not sure congratulations are in order for 7 patches, this only shows a real lack of QA on their part. Let's look at it positively...at least they're not leaving us with an unplayable game. Created player issue? What was the issue?